6086 Canadian soldiers supported by the Royal Navy and the Royal Air Force spilled onto the north coast of France for Operation Jubilee… Almost 4000 were killed, wounded or captured, and a retreat was forced. 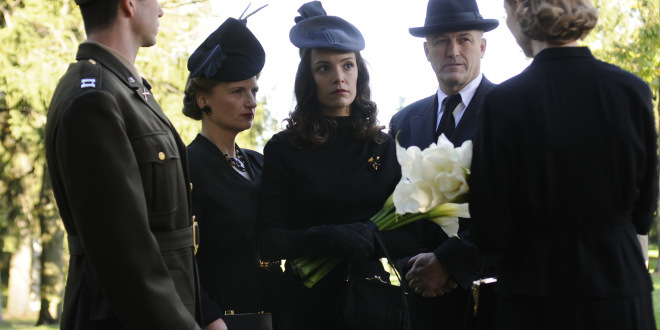 Lorna (Meg Tilly) and Bob Corbett (Peter Outerbridge) know that their son Stanley is most likely on the front lines for the attack, and wait, listening to the lists on the radio, for any clue, any sign of what may have happened to their son. Worst case and all too plausible scenarios filling their heads. And we wait with them, dreading the lists, fearing the word that the newly installed party line phone that they share with their neighbors may reveal (and that brings me back, my father’s parents had a party line phone in New Brunswick for as along as I can remember…). Gladys (Jodi Balfour) is suffering from the death of James in the episode before the break, she carries a measure of survivor’s guilt, knowing in her heart, that she had fallen out of love with him, and was in fact, by her own admission, getting ready to call it all off. But now he’s gone. She’s fallen into a funk, and may very well become her mother, who has never recovered from the loss of her son. The gals bandy together though to try to help her out though, bringing fresh vegetables from their victory garden. Betty (Ali Liebert) is in for a surprise when Theresa (Rachel Wilson) returns from her Bond Tour and is now temporarily on assignment to Vic Mu. She has some guilt about their relationship, still pining over Kate (Charlotte Hegele) but watching the two of them embrace their relationship, and strawberries made me smile. I like when Betty’s happy. Kate, of course has a little guilt of her own, maintaining her relationship with Ivan (Michael Seater) denying who she really wants to be with. And Vera (Anastasia Phillips) gets wrapped up in a little mystery within the factory. She’s gone over the numbers and the inventory, and there are explosives missing… could Marco (Antonio Cupo) be guilty? I love the way this episode puts us right back into the series, it doesn’t pull its punches, we’re back in the war on the home front. We’ve been on leave for 6 weeks, but now they’ve thrown us right back into it, and we realize that even on the home front, the wounds inflicted there will scar and last a lifetime. Bob and Lorna are both carrying guilt over the state of their relationship, which is revealed during the long desperate wait for news of Stanley. Not all of them find ways to deal with it, Bob decides to leave the news stand behind and help sort produce at a local farm, taking some time away from Lorna, because, he tells her, he’s in it for the long game. It’s a beautiful moment, that tells you so much about their relationship and about both of them. Gladys lets the last of James’ possessions go, and plants a tree to his memory, and hopefully she’ll find her way to forgiving herself. This series, one of the pride of Canada, continues to bring this important moment in time to life with characters we love. It continues to engage the heart and the mind, and has wonderfully strong and amazing female characters in any time. 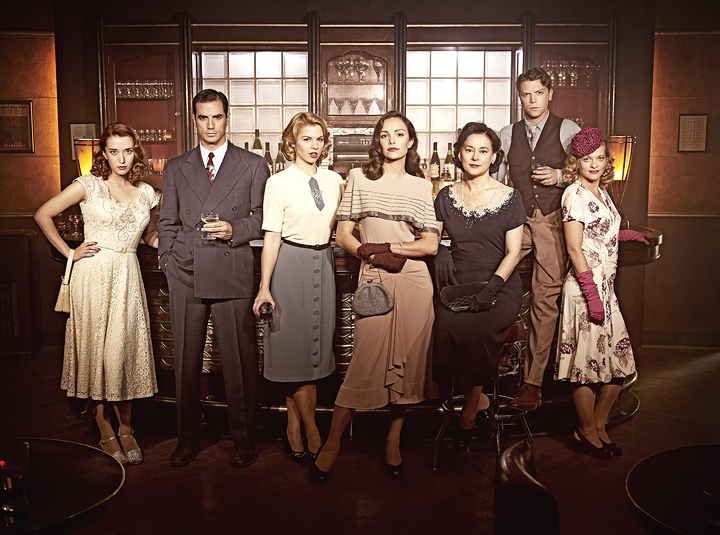 Bomb Girls airs Monday nights on Global.